As a linguist I dread the question, “what do you do?”, because when I answer “I’m a linguist” the inevitable follow-up question is: “How many languages do you speak?” That, of course, is not the point. While learning languages is a wonderful thing to do, academic linguistics is the scientific study of language. What I do in my work is to try to understand how and why languages are the way they are. Why are there so many in some places and so few in others? How did languages develop so many different ways of fulfilling the same kinds of communicative tasks? What is uniquely human about language, and how do the human mind and language shape each other? This is something of a new direction in linguistics. The old-school study of language history was more concerned with language for its own sake: understanding the structure of languages and reconstructing their genealogical relationships. One of the exciting things happening in linguistics today is that linguists are increasingly connecting with the field of evolutionary biology. Evolutionary biologists ask very similar questions about species to those me and my colleagues want to ask about languages: why they are distributed in a certain way, for example, or looking for explanations for differences and similarities between them. These similarities in outlook allow us to apply all the modern tools of computational evolutionary biology to linguistic questions, giving us new insights into fundamental questions about the processes of language change, and through that into the nature of language in general. I recently co-authored a new paper with a set of interdisciplinary colleagues. We use methods adapted from evolutionary biology to investigate how a large group of languages had changed over thousands of years. We chose to concentrate on the Austronesian language family (a huge family of languages mostly distributed along a broad arc from Taiwan to Easter Island) because quite a lot is known about how it spread. With a decent model of the history of a language family it becomes possible to uncover the processes of change within these languages. This is the same basic logic as when Gregor Mendel inferred the principles of heredity by observing how the patterns of variation in the forms of plants were governed by their ancestry. When we understand how the building blocks of language work, we will be further along the path to understanding the human mind. Languages are a lot more than just a bundle of words. They also include all the principles for combining those words into meaningful utterances: grammar. And, like words, grammar also changes over time. We wanted to discover whether grammar evolves in the same way as words. The lexicons of a languages (the set of words each language has) change in two ways over historical time: the sound systems of individual languages change – meaning that their words sound different – and words are replaced by other words through processes including meaning change and borrowing from other languages. Grammars change in similar ways. Gradually, as rules morph into new rules (for example, ways of expression become acceptable which in previous generations were unacceptable – think of the who/whomdistinction, which has nearly disappeared from natural speech), and in big jumps, as languages acquire whole new structures through processes like reanalysis or borrowing. But how close are the parallels between the evolution of words and the evolution of grammar? Answering this question will move us along the road to answering the big questions about the nature of linguistic and human diversity. Using tools from evolutionary biology, we developed a computational model for estimating at what pace and in what manner the different languages of this family evolved. In particular, the model discerned whether words and elements of grammar were evolving at a fast, medium or slow pace. 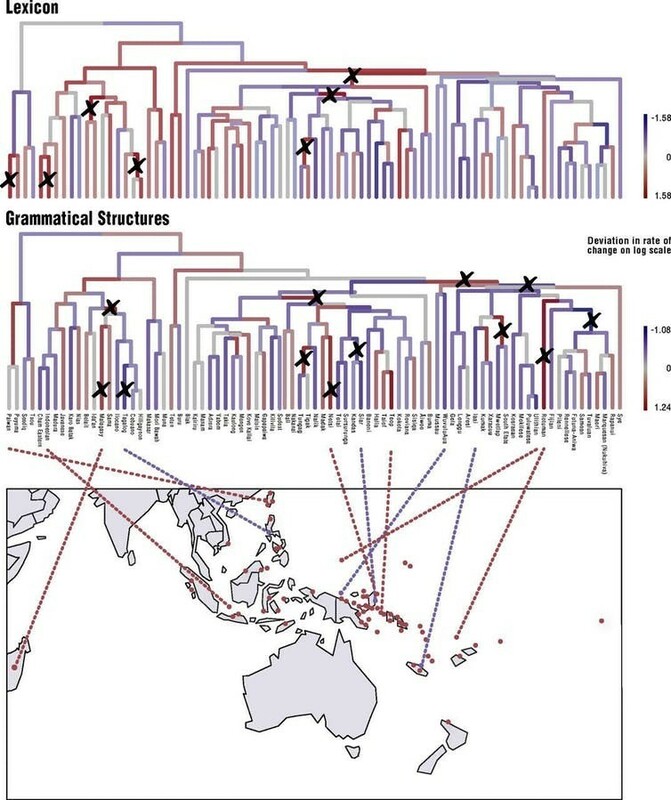 The diagram below shows how the lexical and grammatical elements of the Austronesian languages evolved differently over the history of the family. The redder branches of the tree show where change happened more quickly and the bluer branches where it happened more slowly. The crosses mark big shifts in the rate of change. What is clear from these results is that the way in which the words and the grammar of these languages evolved is very different. Interestingly, measurements show that splits on a branch - points in when new languages are formed - are accompanied by a much bigger burst of change in the lexicon than in the grammar. An important question for further work, then, is to ask what drives the differences in rates of change of different grammatical features. There are hints in the data that grammatical features that speakers are consciously aware of tend to change more quickly, and features which are more abstract and less available to conscious reflection change more slowly. As our estimates of the age of humans as a species get older and older, we are realising that human language is not just a recent add-on. Rather, it’s something with deep evolutionary roots in human (and non-human) consciousness. This is important for the science of human cognition in general, with particular significance in psychology and linguistics. These large scale studies in linguistic diversity have only recently become possible thanks to to parallel improvements in the quality of data we have access to and the quality of the methods we have available to analyse them. Many linguists are embracing the movement towards open data and reproducible science. There are massive interdisciplinary efforts underway to publish open and interoperable data sets in many different domains, and computational tools for studying evolution are becoming richer and more flexible. But as tools and methods improve, world linguistic diversity is decreasing. 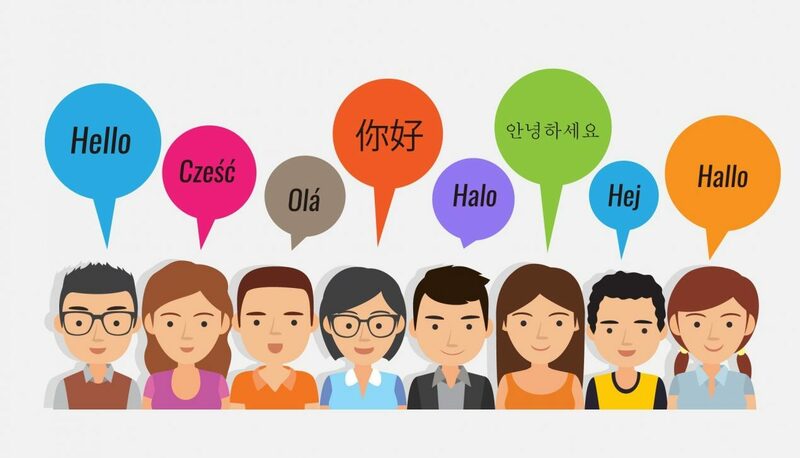 Nearly half the people in the world today speak at least one of Mandarin, Hindi, Spanish, English or Arabic, and thousands of smaller languages are facing extinction. Comparative studies of language are therefore becoming more urgent as a window into the diversity of the human mind.